In the current climate, global standards for education are rising, and America must be able at least to keep pace, if not to lead. While the past three decades have shown a gradual improvement in many indicators of average U.S. student performance, the time has come to push for transformative progress. how they can get involved in existing Collective Impact initiatives or start new ones in their communities. This report is based on interviews with 70 business and CI leaders and the first national survey of CI initiatives leaders and business participants. It builds on earlier research HBS conducted in collaboration with the Bill & Melinda Gates Foundation and The Boston Consulting Group that brought business and education leaders together to better understand best practices for partnerships between business leaders and educators to accelerate improvement in America’s schools. Our research identified three high-leverage ways in which business leaders can engage with educators to bring about significant change for the better: laying the policy foundations for education, scaing up proven innovation that boost student outcomes, and reinventing the local education ecosystem in cities and regions. 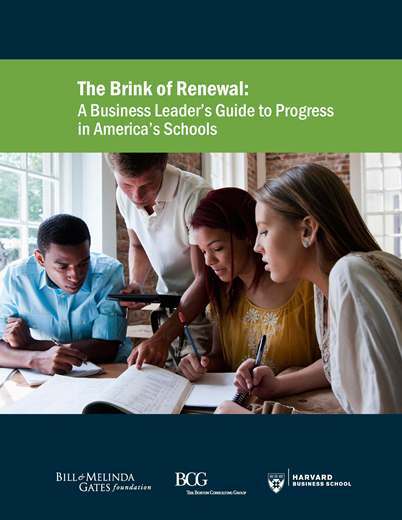 In addition, to understand educators’ perceptions on competitiveness, BCG and HBS conducted the first-ever nationwide survey of school superintendents on U.S. competitiveness and business’ role in education. 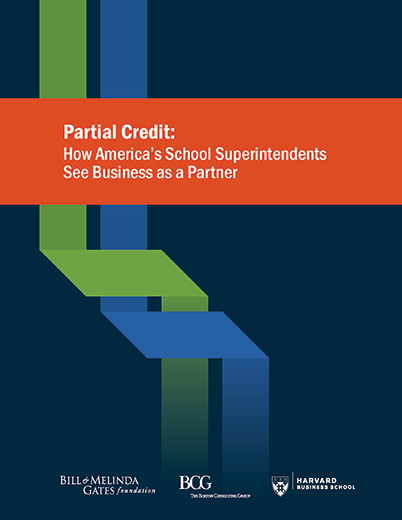 Research findings on how business leaders can engage with educators in deeper, more productive partnerships were highlighted in School Administrator magazine. 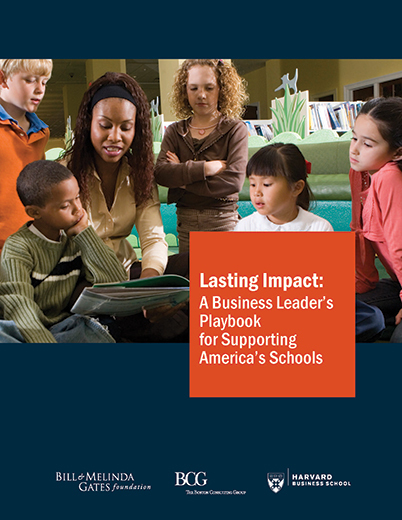 How can business leaders best partner with educators to transform America's schools? Pitt Hyde, a Memphis business leader and the founder of the Hyde Family Foundation, works to ensure the success of the merger between the Memphis City School district and the Shelby County School system. Southwire, a leading maker of cable based in rural Georgia, has partnered with the local school system to staff a factory with at-risk high school students. This booklet provides a practical approach for business leaders seeking to understand the complex issues involved in transforming PK-12 education. StriveTogether is building a network of communities that use Collective Impact as a way for the business community and other stakeholders to collaborate to improve public education in a locale. This case explores the motivation behind P-TECH (a growing skills gap), how it was developed along with the challenges, and the attention generated by the unique school design. This case explores the challenges and complications of replicating P-TECH. The United States must recognize that our long-term growth depends on dramatically increasing the quality of our K-12 public education system, according to Stacey Childress.